(Bloomberg) -- President Donald Trump has turned his focus to his re-election in the days since he emerged unscathed from Robert Mueller’s Russia probe, mounting a fresh attack on Obamacare as he takes an extended victory lap. Trump finds himself increasingly fighting for the spotlight with a growing crowd of Democrats vying for their party’s nomination to challenge him. Both sides have begun carving out positions on key policy issues, and few are likely to be more important to voters than health care and the future of Obamacare. Trump’s first policy move since the release of Mueller’s findings was to wade back into health care. The Justice Department on Monday shifted its position on a lawsuit seeking to invalidate parts of the Affordable Care Act, agreeing with a federal judge’s ruling that the law is unconstitutional and should be scrapped entirely. Trump’s 2020 campaign slogan is “Promises Made, Promises Kept,” and the president appears aware that his failure to repeal Obamacare remains one of the most prominent pledges he hasn’t fulfilled. Democrats have so far welcomed a fight over health care. 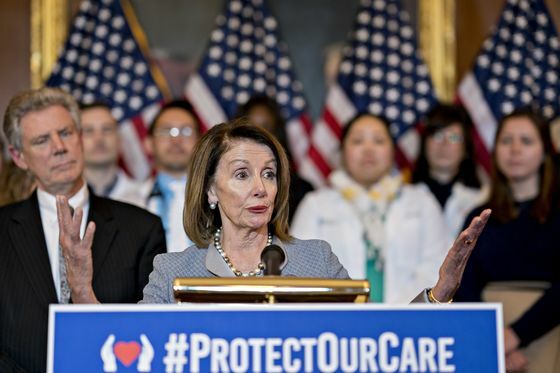 It paid off for them in 2018 -- voter concerns over insurance coverage helped the opposition party reclaim control of the House of Representatives in the November midterm elections. But Trump hasn’t offered specific plans on how he’d replace Obamacare should his administration win its elimination in court. Republican Senator Susan Collins, who faces re-election in 2020, called Trump’s new effort to invalidate the law a mistake and says the focus should be on improving Obamacare. And with Democrats in control of the House, it’s unlikely Trump would be able to win passage of any health care legislation. As Trump and the White House shift into re-election mode, they are propelled by one of the biggest political victories of Trump’s presidency. Attorney General William Barr said on Sunday that Mueller found no collusion with Russia during the 2016 campaign; Mueller also didn’t reach a conclusion on whether Trump obstructed justice. Yet the political fight over Mueller’s findings is far from over -- top Democrats are demanding the release of his complete report and all the evidence he compiled. The coming legal battle could end up in the Supreme Court and drag on through the 2020 election. As the Democratic primary ramps up, with even more candidates expected to enter an already crowded field, Trump will find himself struggling for airtime. And the president -- who wrote in his book “The Art of the Deal” that “bad publicity is sometimes better than no publicity at all” -- has been known to deliberately court controversy to draw media attention when he wants it. White House advisers have warned him against it. They’ve told the president to stay out of the fray, avoid commenting on his opponents, and let the Democrats fight each other, according to one aide. Instead, they’ve urged him to look presidential by highlighting the strength of the economy and popular policies, such as the fight against opioid addiction. He hasn’t stuck to the script. At a visit to an Ohio tank plant last week -- a moment he could have seized to underscore his support for the military and domestic manufacturing -- he instead repeated disparaging remarks about the late Senator John McCain, attacks that have drawn rebukes from across the political spectrum. It’s not unusual for a president to struggle to stay in the headlines while his opponents compete for their party’s nomination. Typically, though, presidents attract attention by embarking on foreign trips and traveling to key states to promote domestic policy achievements. In February 2011, as Republicans battled to challenge Barack Obama, the president traveled to California and Oregon to meet with tech executives and tour a semiconductor plant and to Cleveland to speak at a small business forum. The following month he visited a middle school to discuss education and traveled to Brazil, Chile and El Salvador to meet with those countries’ leaders on trade, income inequality, immigration and drug trafficking. Aside from his trip to the Ohio tank plant last week, Trump has held a rally in El Paso, Texas, focused on immigration, and he made a brief stop in Georgia and Alabama to survey storm damage on his way to his Florida resort. His only international travel this year has been a two-day visit to Vietnam for a second high-profile summit with North Korea leader Kim Jong-Un. 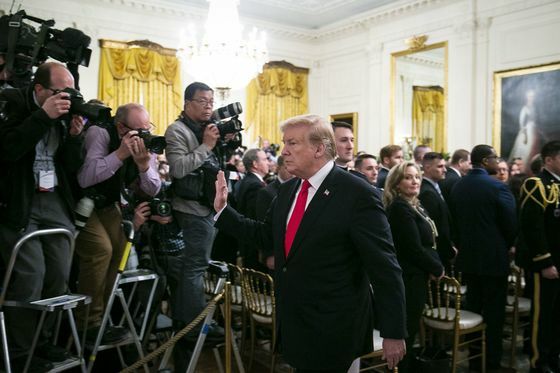 Trump abruptly walked out without a deal. Following the Michigan rally on Thursday, Trump plans to return to his Mar-a-Lago resort in Palm Beach for a long weekend away from the White House. He’ll make a day trip on Friday to a dam on Lake Okeechobee, the headwaters of the Everglades, where he may seek to promote an infrastructure plan.